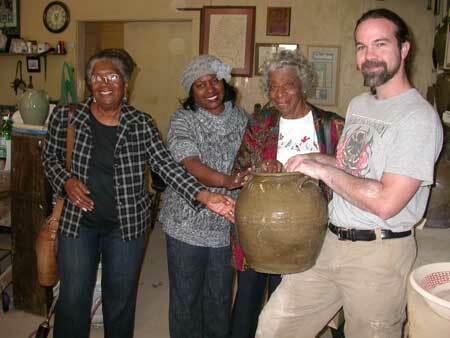 These ladies are touching a Dave pot being held by Justin Guy, potter and the director for the Old Edgefield Pottery Center on Simkins Street, Edgefield. Three ladies recently paid a visit to Edgefield and stopped by the pottery. They brought with them an interest in learning more of Dave the potter. In the photo are Joyce Hansen, Jeanette Samuels and Dr. Henrietta Smith. Hansen is originally from New York, but is living in Lexington, S.C. She has written numerous books for children, especially of the African American Experience (“Googling her will show you her prolific writings,” say her friends). Samuels is a teacher in the Lexington II District and teaches in the Davis Early Childhood Center. Dr. Henrietta Smith is also from New York originally, but now lives in Florida — a professor emeritus of library science at the university of Florida in Tampa. She is also a professional storyteller, and must have found good stories in Edgefield to fill her repertoire. A thank you we received for this article. One Response to "Dave the Potter Brings Visitors to Town"